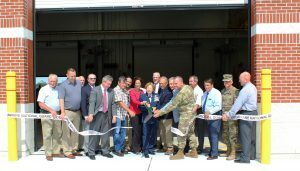 Wohlsen Construction Company and the Delaware Army National Guard celebrated the Ribbon Cutting Ceremony for the new, state-of-the-art Field Maintenance Shop on Friday, July 13th, in Dagsboro, DE. Designed by STV Inc., the 16,400-square-foot maintenance shop will house vehicle maintenance services and on-the-job-training. 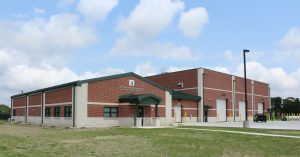 Equipped with oversized work bays and overhead cranes, training areas, offices, and locker rooms, the facility provides guardsmen and guardswomen with a one-stop facility that enhances their ability to respond to situations and improves readiness. The Field Maintenance Shop can also serve as a relief station for residents of Sussex County during snowstorms, flood, hurricanes, or other disasters. This design/build project was designed and constructed to achieve LEED Silver, and utilizes several sustainable features including geothermal wells and a new underground stormwater management system.